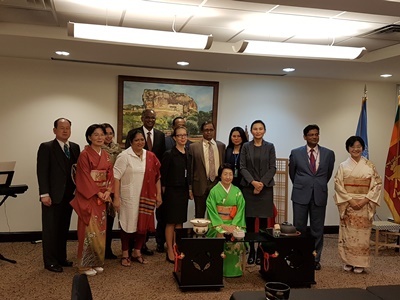 A Japanese Tea Ceremony, traditionally known as Chanoyu, was hosted on the 2nd of November 2016, by the Permanent Mission of Sri Lanka to the United Nations in cooperation with the Universal Peace Foundation. The Ceremony is a choreographic ritual of preparing and serving Japanese green tea, called Matcha, together with traditional Japanese sweets to balance with the bitter taste of the tea. H.E Dr. Amrith Rohan Perera, Permanent Representative of Sri Lanka to the UN, and the Secretary General of the Universal Peace Foundation, Dr. Taj Hamad, welcomed all the attendees. The event included a ceremonial drinking of Japanese tea as well as a musical presentation and performance of a song in expression of Peace on Earth.